23-Jul-2014 -- Machu Picchu has been at the top of my Bucket List since well before we had a “bucket list”. Like forty years or more. Viewing the Nazca Lines was added to our list much later, but as we finally began preparing for our first trip to South America, these two locations had to be integral parts of the trip. Especially as our tour company offered as a ready-made extension to an Inca Trail trek a side trip which would take us on a four hour bus ride south of Lima to the edge of the Paracas National Reserve (near Pisco). There we would have a flight to see the Nazca Lines, as well as a boat ride twelve miles offshore to the Ballestas Islands, an excellent place to see marine and bird life (sometimes referred to as the “poor man’s Galapagos”). The long ride from Lima on the Cruz del Sur Peruvian Bus Line went much better than expected (one might even describe it as "elegant"), and as soon as we arrived at the Paracas bus station, we were wisked off to the local airport for a two hour round trip flight to the Nazca region. The plane ride was reminiscent of a WW-II bombing run from Britain to Germany, with forty uneventful minutes followed by forty minutes of wild aerobatics (as the plane pitched from side to side to give everyone on board a clear view of each of the dozen or so Nazca figures, from the whale and astronaut through spider and monkey), followed by an uneventful flight back to the airport. The flight did give us the opportunity to gaze off to the north in the general direction of the local latitude - longitude crossing, our target of 14⁰ South 76⁰ West. When we arrived at the hotel, however, we got our first inkling something had been lost in translation as our request had been passed from an American company to a Peruvian company in Lima to a local tour company in Paracas to the actual dune buggy company, and we discovered our need to go beyond a “standard” ride with a customized trip to 14⁰S 76⁰W had not been addressed. This began 36 hours of worrying as we worked with the hotel concierge to salvage our DCP trip. However, by the third day, the concierge had come through in locating Mario Corrales of AdrenArena Park (the same man who drove Gerald Wolfe in 2004), and, windstorm be damned, our dune buggy conquest was back on! We were picked up at the resort at about 10 a.m., and carried by van on the road towards Ica to the dune buggy park, where we met Mario. He speaks little English, and we speak no Spanish at all, but he remembered his last DCP adventure from almost ten years earlier, and understood what we wanted to do. He handed us goggles, buckled us into his six passenger, low to the ground, open vehicle, and off we went on a trip that would have been about ten miles straight as the crow flies (however, that was not a route we wound up taking!). We left the Pan American Highway for an unpaved road, then eventually sped onto some gravel flats which gave every indication of matching the astronauts’ experience of bouncing around on the surface of the moon in the Lunar Roving Vehicle. Although the sandstorm limited our visibility, we could make out large (as in "huge') sand dunes drawing closer, and we marveled at how Mario worked his way up the windward slopes, only to plunge down the slip face at what seemed like a 90⁰ angle. Being inside a large cloud of sand distorted my depth perception, but at every turn Mario motored confidently onward. I'm sure our nearness to the ground also made our speed seemed greater. As the dune size increased, so did the difficulty in mastering them. Although this was the most exciting part of the journey, on several occasions we found ourselves stuck, with wheels mired deeply in the soft sand. At which point Mario had to manhandle the craft to bring the wheels back up on top of the sand. From near the crest of the dunes, a reconnoiter on foot convinced Mario once again, although we were less than a kilometer from our destination, he was not going to be able to make it by the most direct route. We worked our way back down to flat ground, and then did a big loop around the high dunes to the other side. We parked a short distance away, and then headed to the exact point on foot. 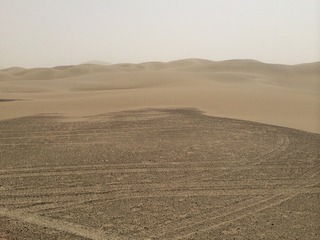 Mario indicated the shifting dunes had migrated quite a bit over the last decade. The large number of tracks also showed the area had become much more popular with local desert racers. When we tried to turn on my camera, we found the paracas and the dune hopping had taken their toll, and several stray grains of sand had rendered my poor little Nikon much less than completely operational. We were forced to rely on our iPhones as backups. Recording the ten zeroes from the GPS screen was much more difficult given the double glare of the GPS and iPhones. And working in the middle of a sandstorm, this was not a day for great pictures in any case! Our task completed, Mario reached in a small cooler in the back to retrieve for us two celebratory adult beverages. Like the dune buggy ride itself, this was a first for our multi continent and multi hemisphere confluence hunting experiences. All in all, this was both the most enjoyable and certainly most heart-pounding DCP visit we’ve had on any continent! With visibility continuing to erode, Mario relied on my GPS screen to retrace our route back to the road system. Along the way we passed many bags of potassium gathered for collection by local miners. #5: Navigator and Driver, the latest conquerors of 14S 76W, record ten zeroes.